I’m trying hard to find creative, cheery ways to make the transition from winter to spring even though the weather is not cooperating. It’s been way too cold here for my liking. Between this cold weather, being a bit run down from my quick trip to Virginia (I’ll post a few pictures later in the week) and coming back to a pre-scheduled surgery for my 10-year old puppy I was seriously in need of some good old comfort food last night. After reaching for a little bit of chocolate one too many times and crashing from all the sugar, I managed to pull myself together, head to the grocery store and bring home some ingredients for one comforting and very satisfying meal last night. On Sunday, a friend on Facebook commented about the dinner she made consisting of pasta shells with prosciutto, peas and Parmesan. The picture of it left a couple of us drooling and asking for the recipe, which she kindly shared. This easy to make meal provided me with a heavenly break from the day’s stresses. I mixed things up a bit with some homemade lemonade in mason jars. Doesn’t everything taste better in a mason jar?! This spring touch along with a grapefruit for dessert (well I never actually got that far), provided a much needed sense of calm and renewal. Sauté one medium onion or leek with a package of chopped prosciutto in some olive oil. Boil one full box of medium sized shells. Once the onions and prosciutto are cooked, add three cups of peas and stir until almost done. Once the pasta is done, add it, along with one cup of pasta water to the other pan with the rest of the sautéed ingredients. Also add one cup of cream and a bit of butter to the pan. Continue to cook on low. Add Parmesan to thicken the sauce. Serve warm with salt, pepper and more Parmesan to taste. I’m starting to pack and get myself ready for a trip to see one of my dearest friends who recently moved to Virginia. She was up here in January, but I was sick as a dog and missed her. I’m long overdue for a visit. This is going to be an easy, low-key trip chock-full of down time, warmer weather (I’ll take anything above 55 degrees at this point) and lots of laughs. In an effort to pack conservatively, I’m doing the mental run through of what can and cannot be left behind. An extra pair of shoes or two (or three) may not be debatable, but my camera is. Although I have a good camera, I’m thinking I may wing it and just rely on my iPhone. I am head over heels happy with my CameraBag app. It was truly a $1.99 well spent! Just look at some of these photos from around the house…. Yep, I think the camera is staying home for this trip. With that decision made I have to stop procrastinating and seriously finish packing. Wish me luck narrowing in on which shoes to bring (wink). 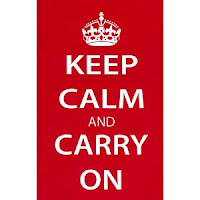 …And Carry On. Two years ago when I was visiting one of my dear friends in Boston, there was a bag she just had to show me in a little boutique, named Acquire, close to her apartment in the North End. Who was I to argue? Off we went and I instantly fell in love with the canvas bag that had this phrase on it “Keep Calm and Carry On.” Needless to say, I purchased the bag and proceeded to carry it everywhere with me. It became my mantra for a good year. And that meant my friends and family picked up little trinkets in their travels with the phrase on it. Today, I have a couple of pillows, a water bottle, cards, and even Band-Aids. I have to say though my favorite is still the original canvas bag. And although I certainly don’t need anything else, I have been thinking about how it would be nice to have a piece of artwork with the phrase on it. Last weekend (yes, I am behind on my blogging), I took a great class locally entitled, “Let’s Get Plastered.” What a cheeky name, huh?! The class was a relaxing day, filled with playing with plaster on an 8×10 canvas. Taking plaster (A.K.A. spackle) right from the hardware store and smearing it all over your canvas you proceed to draw on it with skewers. There was something very Zen like about taking skewers and dragging them through thick plaster. And not having the best spontaneous drawing skills I found myself making a series of lines. In the end, I took my hand dandy iPhone out, found a picture of the British flag and used it as a guide for where to place my lines. 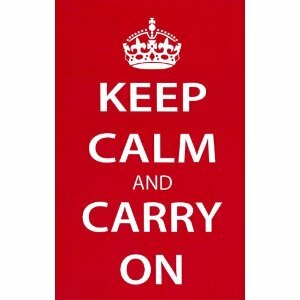 I’m sure you can see where I’m going with this…what good is the British flag without the “Keep Calm and Carry On” phrase?! I quickly found out that writing in plaster is not as easy as it may sound. A few hours later once it was dry I picked out turquoise and pinkish red paints, added a paper crown cutout in the middle and just like that I now have my very own piece of art. Although, I do believe I can’t keep it to myself. We are having an art show at work where my co-workers and I are going to be bringing in our own personal pieces and hanging them in our creative thinking room. In another week or so, I’ll bring it in to share for a few months in the art show before bringing it home for good and hanging it in my home office. In addition to getting ready for an upcoming art class this weekend, I needed a mindless afternoon to decompress from a long week. As I was pulling out my supplies for class, I instantly got in the mood to play and create for a bit. One of the little projects I have been meaning to get to is making some bookmarks. With multiple books going at once and having just joined a book club, as well as having a stack of magazines I’m reading, I’m truly in need of a solid supply of bookmarks. One or two just isn’t going to cut it. I had a plain stack of card stock bookmarks from the craft store that I painted and decorated. I painted all 20 in no time flat. Look at all those pastel, Easter ‘esque’ pretties that I wound up with. I was on a role and simply could not stop there. Using one of the bookmarks as a template, I cut out a good couple of dozen bookmarks from white embossed paper I had. After a couple of hours, I looked up and was literally surrounded and had to laugh at how engrossed I had become in such a simple project. With more bookmarks than I knew what to do with, I bundled up bunches of them for a few family members and my fellow book club members. What a fun little surprise to hand out as I catch up with people. Soup. Yep that’s it (were you expecting some glamorous new age gadget? ), homemade soup. You know the kind, where lunch cannot come soon enough. I’ve been feeling the need to make a couple of batches of different soups before spring comes and the ‘food for my soul taste buds’ move on to other things. This week’s batch is a hearty recipe called, ribollita. If you like vegetable soup, then you will love this soup. It’s has a couple of surprises in it (including bacon and sourdough bread). Check out Barefoot Contessa’s recipe. An ever growing stack of books and magazines. Cuddle time with Jax the Dog. And a quick walk around the still, snowy backyard.